The Ohaus Harvard Trip Balance Series are precision weighing instruments, designed to provide years of service with virtually no maintenance. Harvard Trip Balances employ a two-pan design based on the classic Roberval balance principle. They have the additional advantages of magnetic damping, beams with sliding weights and two styles of weighing platforms. 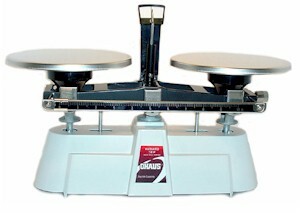 Two-pan Balances of this type are commonly used for comparative weighing to determine the difference in mass between two objects rather than their absolute value. Built-in sliding masses on the side beam, Model 1450-SD, is usually sufficient for this purpose. The 1450-SD Balance is a single side beam model. The 1500 Series (Models 1550-SD and 1560-SD) are double side beam models for higher capacity weighing. Maximum Balance capacity for all Harvard Trip Balances is 2kg/5lbs. The Platforms used on the Balances are 6" diameter stainless-steel plates.